Marine Corps Camp Lejeune is located in southeastern North Carolina. The largest Marine Corps base on the East Coast, Camp Lejeune plays an important role in the Marine Corps’ expeditionary abilities. Several training schools are housed at Camp Lejeune, including Camp Geiger, the Marine Corps School of Infantry, East; and Camp Johnson, the Marine Corps Combat Service Support School. The mission of Marine Corps Base Camp Lejeune is to support the various Marine Corps commands, a major Navy command and a Coast Guard command as well as the Marine Corps Base (MCB) itself. Camp Lejeune owns all the real estate, operates entry level and career level formal schools, and provides support and training for tenant commands. Camp Lejeune with its various satellite camps, housing, training areas and New River Air Station is the largest concentration of marines and sailors in the world. 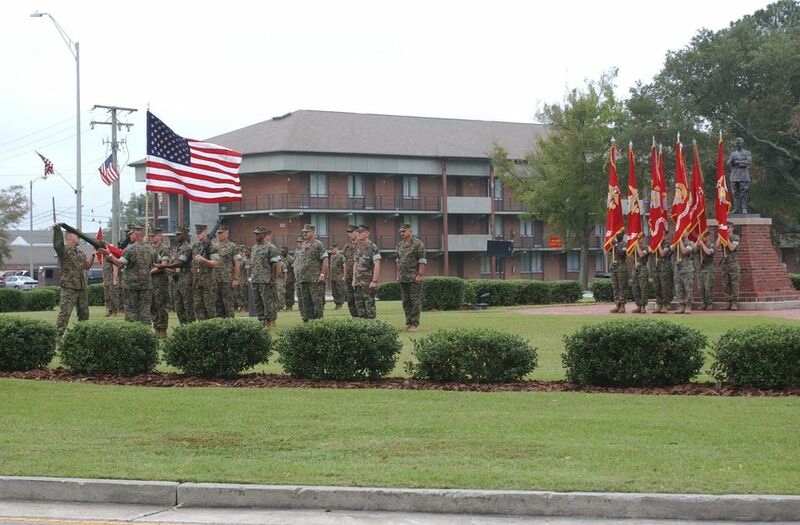 From the young man or woman reporting aboard for their first assignment to the seasoned veteran, and from the dense foliage of woodland cover to sandy beaches and oceanfront training area, Camp Lejeune is truly the "Home of Expeditionary Forces in Readiness". The largest command on the base is the II Marine Expeditionary Force. Its mission is to deploy as a Marine Air Ground Task Force (MAGTF) in support of Combatant Commander (CCDR) requirements for contingency response or Major Theater War. Marine Corps Camp Lejeune is located in southeastern North Carolina near the City of Jacksonville. Camp Lejeune and the City of Jacksonville are adjacent to the New River flowing to the Onslow Beach area. Camp Lejeune occupies about 153,439 acres with 14 miles of beach on the Atlantic Ocean. Albert Ellis Airport, Richlands, NC, is located approximately 25 miles from Camp Lejeune. Marine Corps Base Camp Lejeune is home to more than 47,000 Marine and Sailors from around the world. For more than a half-century, Camp Lejeune has been the home base for the II Marine Expeditionary Force, 2d Marine Division, 2d Force Service Support Group and other combat units and support commands. Permanent Change of Station (PCS) reservations may be made one year in advance; TAD/TDY reservations may be made 90 days in advance; leisure travel reservations may be made 60 days prior to arrival date. Eligible patrons include Active Duty, Retirees, Dependents, and DOD employees. Due to very high demand, reservations are strongly encouraged. Camp Lejeune family housing is considered some of the finest in the Marine Corps. The near 4,500 units are well maintained and are continuously updated. Many homes have been renovated, and renovations on other quarters are either in progress or programmed. All quarters offer central air conditioning and heating. BOQ/BEQ housing is available to all members not having dependents residing with them for both PCS and TDY military members. BOQ spaces are located throughout Camp Lejeune and reservations can be made at the desired location, All Points Inn, Camp Geiger, Camp Johnson, Courthouse Bay, and MCAS New River. Bachelor Enlisted Quarters (E-6 to E-9) are located throughout Camp Lejeune and MCAS New River. Geographical Bachelors are provided with quarters on a space available basis. Many times this is not available to members in the grade of E-4 and up. Enlisted members, E-1 through E-5 are provided with quarters via their unit assigned Barracks. Camp Lejeune and New River Air Station are home to seven Department of Defense Education Activity (DoDEA) schools. These schools are available to all ranks for all children who reside aboard either MCB Camp Lejeune or MCAS New River. Families who have received a “90-day letter” (The 90 day letter verifies that the housing office expects that you will be offered base quarters within 90 school days) from base housing may also enroll their children in the DoDEA schools; however, transportation is only provided for families living aboard the base and air station. Schools compete with the local school districts at the 1A level in baseball, softball, football, volleyball, tennis, swimming, golf, and soccer. All legal dependent children who reside with their military sponsor in permanent base housing are eligible to attend Camp Lejeune Dependents Schools. School has a Half-day Pre-K program and full-day kindergarten program. Elementary school hours are 8:45 a.m. - 3:15 p.m.; Middle and High School hours are 7:50 a.m. - 2:35 p.m. The Lifelong Learning Center is the primary education office for adult education programs at Camp Lejeune and MCAS New River and operates under the cognizance of Marine Corps Community Services and Headquarters Marine Corps. The Naval Hospital provides primary medical care to Marines, Sailors and their families stationed at Camp Lejeune, Camp Geiger, Camp Johnson, and New River Air Station. The Camp Lejeune Naval Hospital is one of the newest military hospitals in the South with a 117-bed capacity expandable to a 236-bed capacity. It is staffed with most major medical specialties. All members and their dependents have access to medical benefits provided they have their Identification Card and be enrolled in TRICARE Prime. The hospital offers Nurse Advice Line 24 hours a day. The nurse will make an assessment and determine any health care needs. If needed, the nurse can refer patients to the Emergency Room or schedule an appointment for the appropriate after hours clinic with a Primary Care Manager. Dental services are provided to the active duty military personnel of the Base commands through the eight clinics aboard the base. The clinics provide space-available dental care to eligible family members and military retirees. Coastal North Carolina offers many outdoor activities with near year round tolerable weather whether on the beaches and the many lakes in the Summer, or the Mountains in the West throughout the year. Larger metropolitan areas such as Raleigh - Durham, Charlotte, Asheville, and Wilmington, are just a few hours drive away and offer professional sports, college sports / activities, concerts, and more entertainment.